The Amalfi Coast is one of Italy’s most impressive stretches of coast, and this gem of a villa truly compliments the magnificence of its natural surroundings. Enjoy an invigorating outdoor shower while you look out on the expanses of sea and coast below. While the views alone put this villa in a class of its own, it’s also packed with amenities, from satellite flat screen TVs in every bedroom to a wood-burning pizza oven in the kitchen. For an unforgettable vacation, this is the place. 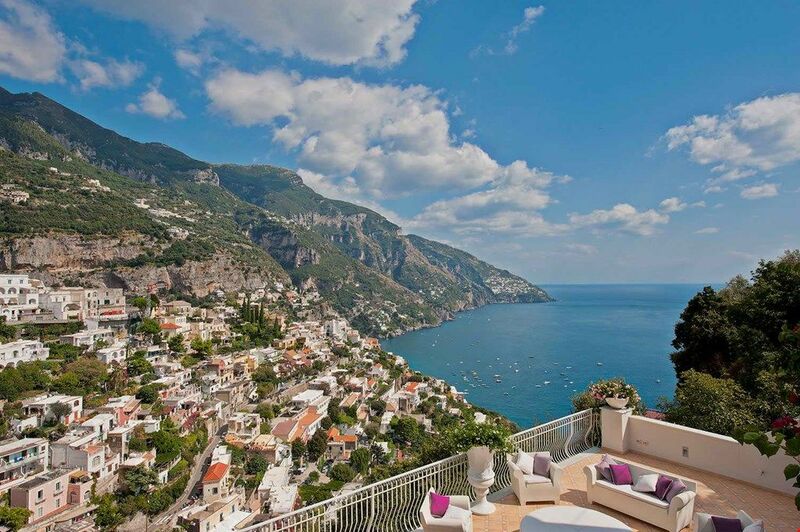 This 3 story villa has an elevator and is set above the town of Positano with views of the Amalfi Coast and sea. The villa can be reached from the parking area, which has space for 3 cars, by descending an external stairway of about 50 steps. There are three terraces on multiple levels that are furnished for al fresco dining, soaking up the sun, enjoying an outdoor shower, or simply enjoying the breathtaking panoramic views. Lower Floor: This level has a spa area with a sauna and indoor pool. As well as a bedroom that is reached via three steps, with a queen-size (160 cm) bed, satellite TV, air conditioning, telephone, access to a terrace, and an ensuite bathroom with a toilet, shower, and sink. Middle Level: This level has a living room with armchairs and a fireplace. A kitchen area is equipped with an oven, dishwasher, microwave, toaster, Italian coffee machine, and American coffee machine (be sure to bring filters!). There’s also a wood-burning pizza oven. The dining room has a table and chairs for 12 guests, as well as a flat screen satellite TV. There’s a nearby guest bathroom with a sink and toilet. This floor has three bedrooms. Each has a queen-size bed (160 cm), flat screen satellite TV, and an ensuite bathroom with a sink, shower, and toilet. There is also a terrace with an outdoor Jacuzzi. Upper Level: This level has a living room with a vaulted ceiling, three sofas, and satellite TV. There are two bedrooms, each with a queen-size bed, flat screen satellite TV, and ensuite bathroom with a shower, sink, and toilet. One of the bedroom has access to a small terrace with a Jacuzzi tub. Housekeeping is provided for 4 hours per day, Monday through Saturday. Additional Housekeeping can be arranged for an additional fee. Spectacular. It exceeded our expectations. The view and outdoor terrace was extraordinary . The property was clean and very well maintained. Loved the pool area and sauna. The terrace and view were the best. Evey bit of the villa was beautifully decorated. Great attention to detail. Loved that it had 6 beautiful bedrooms all the private bathrooms. Everyone had beautiful and equal accommodations. Positano. Walking certainly possible, we did it but lots of steps and inclines. We brought body wash, shampoo, there was some there. They did have hair dryers. No wash clothes in Italy. Also went to Da Adolfo. Lots of fun. Great fish just a little rustic. No frills here. It's fine but just be prepared. No problems finding it, however we did hire a driver through the property manager who picked us up in Rome and drove us to the villa. Everything went very very smoothly. Filomena was outstanding!! So very helpful with check in. We were going on to Capri for four nights. Our ferry was cancelled from Positano. Filomena was so incredible. She helped us make new arrangements. Don't know what we would have done without her. Great job!! She's the best! Best place ever. Everything was as advertised and perfect. Very accommodating. Clean and well designed for 12 people. The rooster waking me up at 2:30 each morning. Also long walk to town. Everyone was so nice and helpful. Nice little town with great views. Try getting chef-prepared meals. This was especially important in our first day in the villa, after the 3.5 hour ride down from Rome. It allowed us to relax and unwind without having to go out to dinner. Very nice. We enjoyed the location and amenities of this villa. Elena the service staff was wonderful. The check-in and check-out process was easy. A little noisy early AM with nearby roosters. No, GPS directions are easy if meeting at Hotel Agave. Overall, it was magnificent. The villa is well equipped, well layed out and has a great view. Designed for 12 people with ease. We got daily assistance from housekeeping which was perfect. Ultra modern and very spacious. All the extras. Other than a noisy rooster in the early morning, there was not much to dislike! Well within walking distance, bus to waterfront also available. Markets and restaurants nearby are excellent. On edge of Positano and yes, easy walking. Ferries available to Capri and other destinations. Fifteen minutes or so to Sorrento. GPS works well and you can also use Google maps and go to street level to see the nearby hotel and the parking area (under construction in the photos). About as easy as it can be since the local agents are very flexible with a bit of advance notification. There were ten family members in our party and they all thoroughly enjoyed the villa. The views from the villa were stunning. The villa itself was great. Good size bedrooms, each with its own bathroom. Two hot tubs, one inside and one outside. Overall experience was excellent. A well-maintained villa overlooking Positano and the sea. Daily cleaning service made life easy. All rooms were ensuite. Views were outstanding. Kitchen was very well-equipped. Very comfortable, not stuffy. Great staff!!! Need some softer pillows. Otherwise, everything was superb!! We enjoyed Positano. Just a short 900 steps down to the sea or a walk down the local road. We hiked the trails above Positano and the other villages in the area. Enchanting!! We visited Amalfi, Ravello, Capri, Pompeii, Sorrento...all unique and fun. We did not have enough time to do all that we wanted. Poistano. Yes, a short walk down the road or steps down to town. Not for faint of heart...very vertical area, but gorgeous. Bring shampoo, hand soap, and laundry detergent. The cleaning person will do your personal laundry, as long as you bring or buy detergent. Ziplock bags were not locally available...bring some, very helpful. Good restaurant in Positano "Three Sisters", down by the beach. In Montpertuso (up the hill from Positano) for dinner "Donna Rosa", for lunch in Montpertuso, Schirocco (great food and wonderful views). We did not use GPS and arrived to our destination with relative ease, following the directions.